(Nanowerk News) A new process has been developed for spontaneously incorporating and assembling carbon nanotubes (CNTs) and oxygen scavenging nanoparticles into chloroplasts, the part of plant cells that conduct photosynthesis – converting light into energy (Nature Materials, "Plant nanobionics approach to augment photosynthesis and biochemical sensing"). Incorporation of CNTs enhanced electron flow associated with photosynthesis by 49% in extracted chloroplasts and by 30% in leaves of living plants, and incorporation of cerium oxide nanoparticles (nanoceria) into extracted chloroplasts significantly reduced concentrations of superoxide, a compound that is toxic to plants. 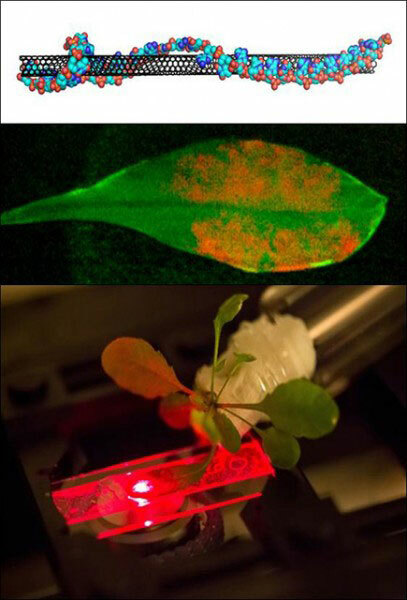 Nanobionic Leaf: DNA-coated carbon nanotubes (top) incorporated inside chloroplasts in the leaves of living plants (middle) boost plant photosynthesis. Leaves infiltrated with carbon nanotubes (orange) are imaged with a single particle microscope that monitors their near infrared fluorescence (bottom). Chloroplasts alone absorb light only from the visible portion of the solar spectrum, allowing access to only about 50% of the incident solar energy radiation, and less than 10% of full sunlight saturates the capacity of the photosynthetic apparatus. This nano-bio approach is believed to increase the breadth of the solar spectrum that is used to make energy and is expected to contribute to the development of biomimetic materials with enhanced photosynthetic activity and improved stability towards oxidative degradation. A novel nanobionic approach has been developed that imparts higher photosynthetic activity to plant leaves and extracted plant chloroplasts, the biological organelles that convert captured carbon dioxide into solar energy. While chloroplasts host all of the biochemical machinery needed for photosynthesis, little is known about how to engineer chloroplasts extracted from plants for long-term, stable solar energy harnessing. Now, researchers at the Massachusetts Institute of Technology have discovered that highly charged single-walled carbon nanotubes (CNTs) coated with DNA and chitosan (a biomolecule derived from shrimp and other crustacean shells) are able to spontaneously penetrate into chloroplasts. This new lipid exchange envelope penetration (LEEP) process for incorporating the nanostructures involves wrapping CNTs or nanoparticles with highly charged DNA or polymer molecules, enabling them to penetrate into the fatty, hydrophobic membranes that surround chloroplasts. Incorporation of CNTs into chloroplasts extracted from plants enhanced choloroplast’s photosynthetic activity by 49% compared to the control. When these nanocomposites were incorporated into leaf chloroplasts of living plants, the electron flow associated with photosynthesis was enhanced by 30%. These results are consistent with the idea that semiconducting carbon nanotubes are able to expand the light capture by plant materials to other parts of the solar spectrum such as the green, near infrared and ultraviolet. Another major limitation in the use of extracted chloroplasts for solar energy applications is that they easily break down due to light- and oxygen-induced damage to the photosynthetic proteins. When potent oxygen radical scavengers such as cerium oxide nanoparticles (nanoceria) were combined with a highly charged polymer (polyacrylic acid) and incorporated into extracted chloroplasts using the LEEP process, damage to the chloroplasts from superoxides and other reactive oxygen species was dramatically reduced. This nanobionics approach is expected to contribute to the development of biomimetic materials for light-harvesting and solar energy conversion, as well as biochemical detection with regenerative properties and enhanced efficiency.